As the weather cools off outdoors, we’re excited to unveil the 2015 Vail Jazz Winter Series, a lineup jam-packed with headliners that are sure to kick up the heat! This year we have something for everyone, from high-energy jams to intimate soirées. We’ve even thrown in some live webcasts to boot! A hard-edged funk/rock/jazz/hip-hop band led by New Orleans native Trombone Shorty, the group employs hip-hop beats, rock dynamics, and jazz improvisation. Beginning his career as a bandleader at the young age of six, then touring internationally at age 12, he spent his teens playing with various brass bands throughout New Orleans and touring worldwide with Lenny Kravitz. Co-presented with Vilar Performing Arts Center. SOIRÉE WITH MARCUS ROBERTS – SOLD OUT! After losing his sight at the age of 5, Marcus Roberts taught himself to play the piano through the gospel music of his local church and later by imitating the style of jazz piano greats. James P. Johnson, Duke, Art Tatum, he learned them all, eventually crafting a distinct sound all his own. A superb pianist with a deep love for New Orleans jazz and blues, Roberts has created a sparkling career out of his impressive technical ability, his remarkable interpretive skills and a decade-spanning musical partnership with Wynton Marsalis. In fact, Marsalis deemed Roberts “the greatest American musician most people have never heard of”. The sound of Jazz Manouche, or Gypsy Jazz, has been whispering its way out of smoky bars and bistro corners since French guitarist Django Reinhardt first laid its foundations in the 1940s. Almost 80 years later, torchbearers of this captivating music play on, supplementing the classic sound with the jazz idioms of today. Guitarists Frank Vignola, Vinny Raniolo and Andreas Oberg have risen to the top in the most recent generation of Gypsy Jazz greats, playing Reinhardt’s originals, the American Songbook and stunning compositions of their own creation. Jaw-dropping technique and a wildly diverse repertoire make this performance a highlight of the winter season. SOIRÉE WITH DIEGO FIGUEIREDO – SOLD OUT! 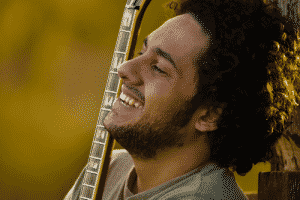 This Brazilian guitar phenom rose through the ranks of classical, jazz and his native music of Brazil through the fervent application of one fundamental musical principle: passion. A whirlwind of unprecedented speed and stirring musicality, Diego Figueiredo shines a playful, heart-warming light on jazz, bossa nova and samba standards. 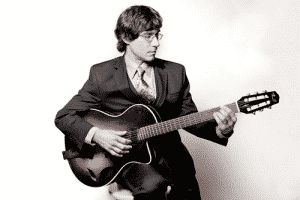 Figueiredo is joined by University of Colorado Professor of Bass, Eduardo “Bijoux” Barbosa. Tony “does not swing, smolder or smoke… he burns,” says Critical Jazz Review. Mentored by the legendary Jimmy Smith in what is considered to be the more classic style of jazz organ, Tony Monaco has received considerable acclaim in the past decade as a colossus of the Hammond B3. After finishing a series of world tours with Pat Martino, Monaco brings his own fiery, explosive flavor of jazz to the table, backed by Fareed Haque on guitar and Greg Fundis on drums. 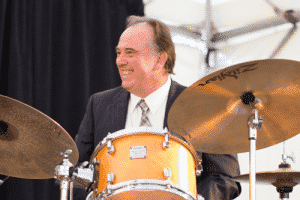 You’ve seen him grace the stages of the Vail Jazz Party, lead bands throughout the state of Colorado,and share the stage with the likes of Curtis Stigers, Tony Monaco and Tony DeSare. Now Allan Finney, a longtime Vail local and member of the Vail Jazz Board of Directors, will release his debut album with a raucous, celebratory blowout like no musical gathering Vail has seen yet. The evening will feature Eric Gunnison on keyboard, Bob Rebholz on sax, Mark Simon on bass, Bill Kopper on guitar and Justin Allison on vocals.